Q&A: Is it guaranteed that All NOCs 0, A and B will be eligible for the new Federal Skilled Worker Program? - Gateway to Canada | Canada Immigration Consultancy! Q&A: Is it guaranteed that All NOCs 0, A and B will be eligible for the new Federal Skilled Worker Program? 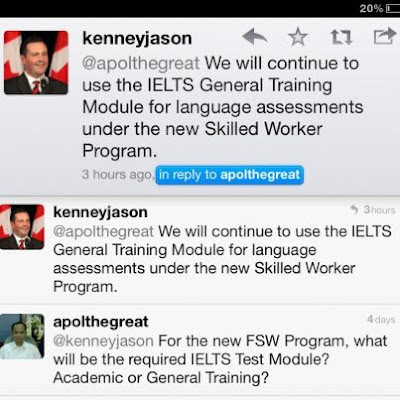 Is it guaranteed that All NOCs 0, A and B will be eligible for the new Federal Skilled Worker Program? This is a common question I'm receiving from interested applicants who are planning to file an application for permanent residence in Canada. They are asking this question after I posted this: More Occupations to Open for Canada's Skilled Worker Program | Get Ready for January 2013 . There is no official announcement yet from Citizenship and Immigration Canada confirming the final details of New Federal Skilled Worker Program, the New FSW Points System and the IELTS Test Module Required. The information I'm sharing here is based on the statements of Canada's Immigration Minister, Jason Kenney. You can read more about Jason Kenney from his official website: http://www.jasonkenney.com. You will find in his website the Twitter Account (@kenneyjason) he is using. On the eligible occupations for the new Federal Skilled Worker Program. On the required IELTS Test Module. So there. Now, it is up to you to decide how to make use of this information. This may still change, of course. So you have two options: Prepare now or wait for the official announcement. Remember, however, that there is a limit on the number of applications to be accepted. If you will not prepare as early as now, there is a great chance that you will never make it. If you are really determined to live and work in Canada to give your family a better quality of life, you must do everything in your power to make it happen.